Scooters moving quickly along the streets of Hanoi. 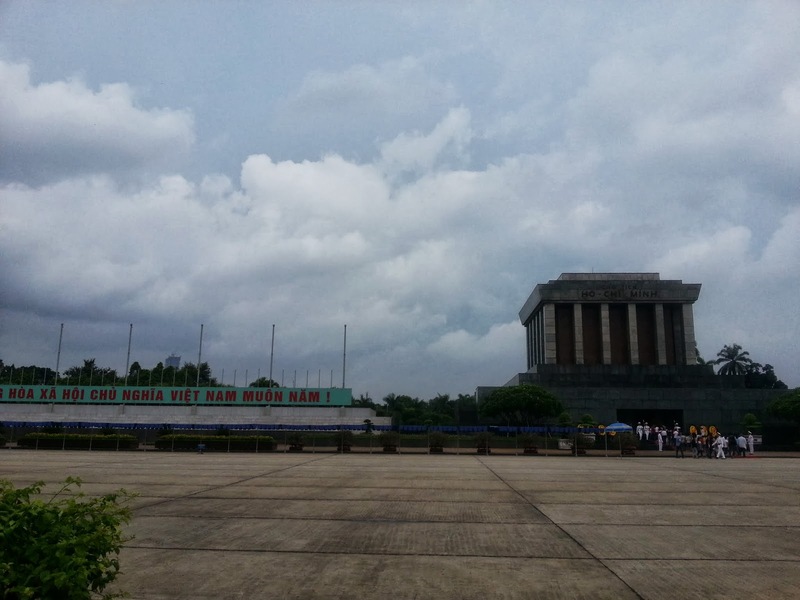 Our first stop after leaving was to be Ho Chi Minh's Mausoleum. 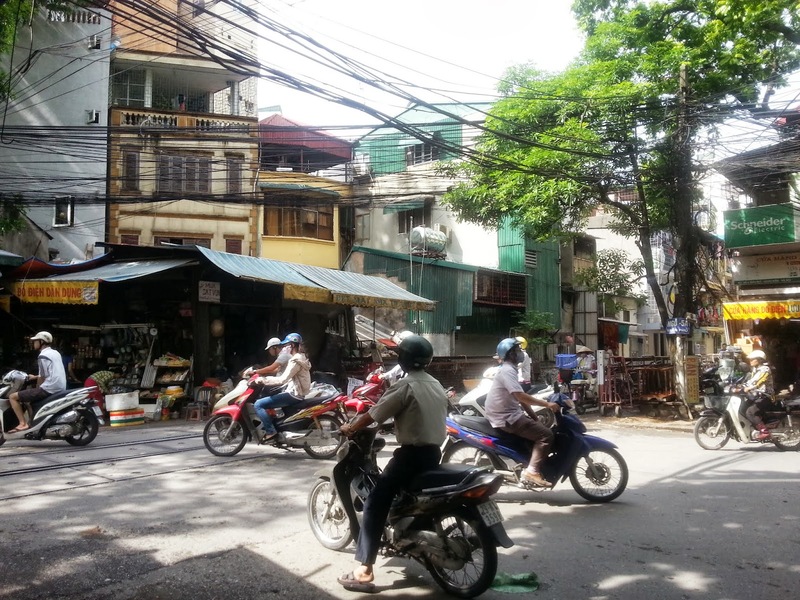 On the way there, we took lots of photos of the hundreds of motor bikes zooming along the roads. We came to a large road, crossed it, and walked into a park with a giant statue of Vladimir Lenin. I had a bit of an obsession with the guy during high school, but I spared Jackie any history lessons. Lucky her! There was a really cool thing about the statue: it had become a place where many local youth went to ride their skateboards. 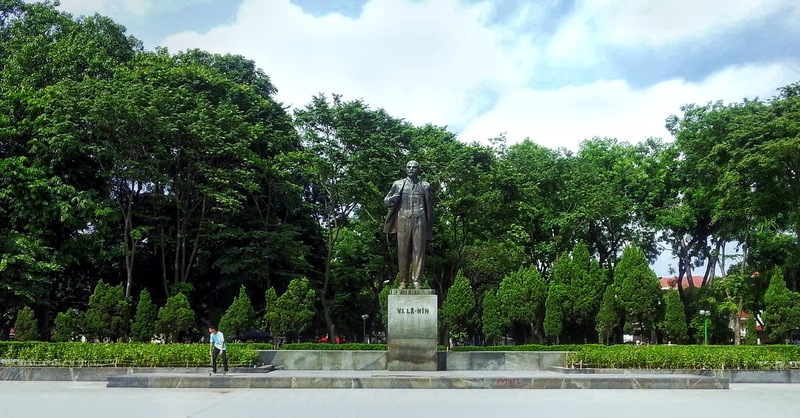 Statue of Lenin in Lenin Park, Hanoi. 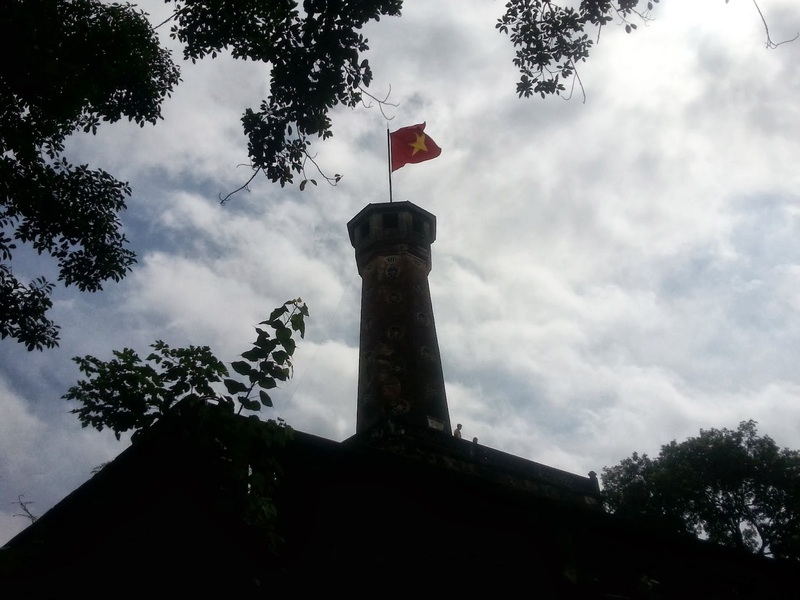 After hanging out in the park for about ten minutes, we walked across the street to look at the Flag Tower of Hanoi. The tower looks old and oddly beautiful, though it certainly has a cold, military look to it. And while the walls nearby are topped with barbed wire, Directly outside the wall you can sit and drink coffee. Then it was off to the mausoleum. We came upon it, but found out we could not walk across the open field in front of the building. The uniformed guard motioned to us to stop as we started to began to cross it. We had to walk around the field and through a neighborhood to get to the entrance. I had read some blogs that said everyone had to dress up in order to be allowed into the mausoleum. However, I had forgotten that and dressed in shorts and a t-shirt. As we approached, I was dreading being turned away. When we got to the line to walk in, I noticed that lots of people, including local people, were dressed in all sorts of ways. Hardly anyone was not dressed casually! The experience was surreal. You stay in a long line and get to a security checkpoint where they take your cameras. We thought they would also take our phones, there is a sign that says you can not have your phone, but, although we offered them the phones, they motioned that we could keep them. Cool. Eventually, the line winds its way toward the entrance where men in white uniforms line your last few yards up to the large doors. Once inside, you go left, then quickly you go right, the line moving at a steady pace now. 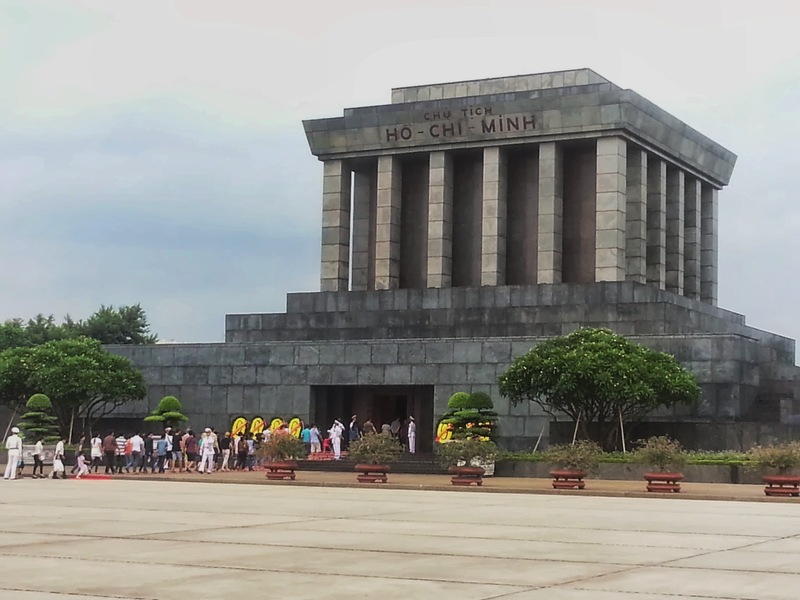 You go up some stairs, make another turn, and you are facing the doors to the room containing Ho Chi Minh. Inside, everyone is silent. The room is dimly lit. It is square, smaller than I imagined, with a large, canopied bed in the middle. A sort of dry moat surrounds the bed with many guards filling the empty space.Their heads are about at the level of the everyone's feet. You are basically a big step away from being at the bed, that is to say, it is a very close view. 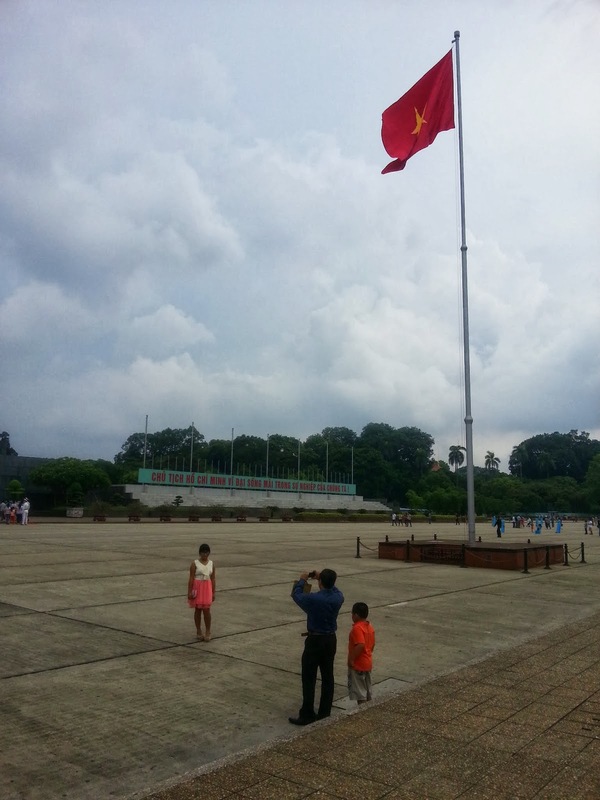 Ho Chi Minh, himself, looks like a wax figure of a person rather than an actual corpse. I have been to a few funerals and dead bodies always look a bit strange, he, having been dead for 44 years, looks the strangest by far. Honestly, it does not seem like it is a real person in the bed. And seeing people venerate this man seems otherworldly. It is a feeling I have never really experienced before. I highly recommend checking it out. Outside, you get your cameras back and are able to stand in the large courtyard and take photos of the building. Guards patrol the field between the courtyard and the street where we had tried to enter from earlier. It is pretty laid back outside, a nice contrast to the rigidness of the line to and through the building itself. The clouds, which had been lingering most of the day, began to really darken. We had to get to our next appointment too: a cooking class. Jackie is a sneaky sneak taking pictures of the guards! These ladies kept walking around the grounds. Jackie loves cooking. I love eating her food. She stumbled upon a Vietnamese cooking class in Hanoi with Hidden Hanoi and we agreed to take it together. We walked for a couple miles and found the place. Right as we got there the rain started coming down hard. Perfect timing! Jackie is certainly a better cook than I am, but I tried my best. I mostly chopped things up and mixed some stuff together. We each worked at different stations. Towards the end, we put everything together and made a bunch of spring rolls. We grilled some meat as well. But the coolest part was learning how to peel a tomato and shape the skin into a rose. I totally know how to do it now! After cooking, we sat with the instructor, a patient, well-spoken, tiny, kind Vietnamese woman, and talked while we ate. She is very traveled and interesting to speak to. Jackie and I have been travelling a lot recently, so we all had stories to tell or ideas to bounce off each other. She told us the concept behind how the Vietnamese family views meals. It was a nice, relaxing meal. On the way back from the cooking class, we stopped at a giant pagoda. People were praying in rooms around the pagoda. There were many plants surrounding it. Also, it looked like people had left offerings at alters all over the place. 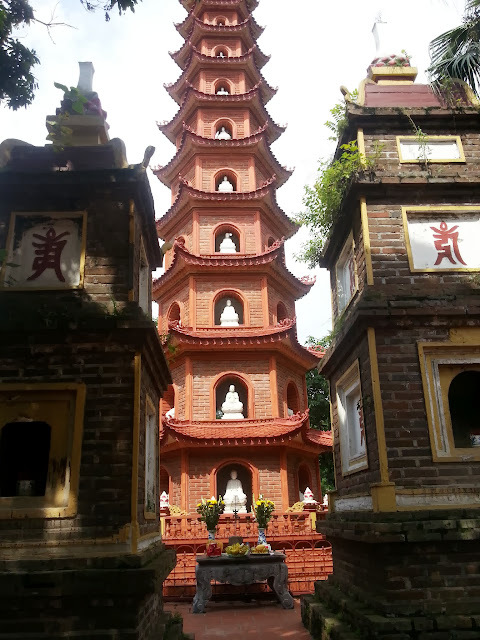 Most of the offerings were fruit, but there were also stacks and stacks of Vietnamese beer. Decidedly less awesome was what happened on the walk immediately after that. We passed some people selling things on the sidewalk. No big deal. It happens all the time in Seoul. Usually they try to catch your attention, but left you walk by without too much pressure. However, one of the women carrying produce across her shoulders, a common sight in Vietnam, aggressively pushed us to take a picture of her. 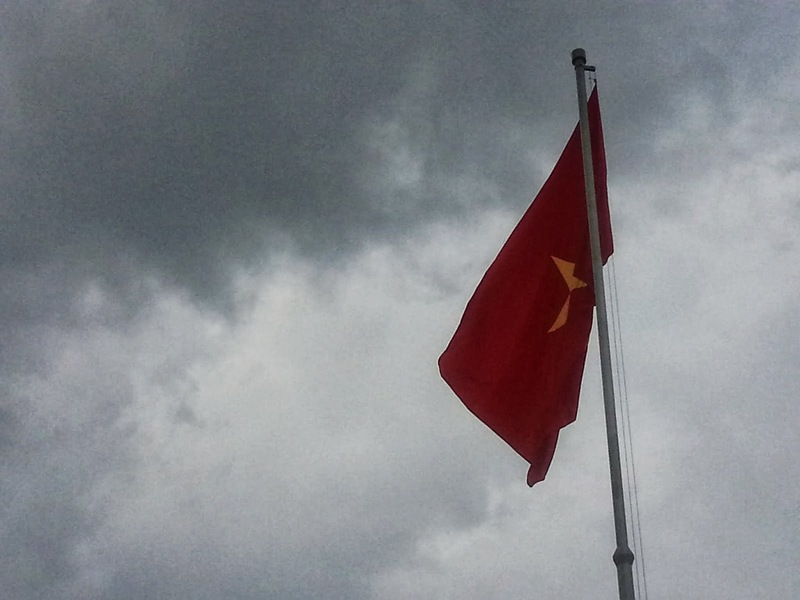 A coworker of mine who had been in Vietnam a few years ago told me not to listen to them. But she was so nice and said it would be free. I couldn't bring myself to be mean. She then forced Jackie to hold the bar across her shoulders so I could take a picture of her. Jackie did not want to, and I thought it was weird that the lady was so aggressive. But neither of us wanted to be rude, so she took the bar and held it while I took a picture. It was awkward, but whatever. Then, she asked us to buy bananas. We politely said we did not want any. Another lady suddenly walked up and began half-arguing, half-selling things at us. She was pushing postcards on me while the other lady tried to force bananas on Jackie. We tried to just walk away, but they kept stepping in front of us and grabbing to hold us there. Eventually, I told Jackie that we should just buy some bananas and leave. I ripped out some money and paid the mean lady more than the fruits were worth. We left really disappointed in ourselves for not being meaner. I hate being taken advantage of. We never ate the bananas. So there is a fair warning for any visitors: Just keep walking. Still a little shook up, we decided to visit a local bar and relax. They had Tiger beer for very, very cheap. I drank that and a few gin and tonics while Jackie went across the street to shop for about an hour. She ended up buying some nice things at Sen, a handmade clothing, textile goods, and accessories store. 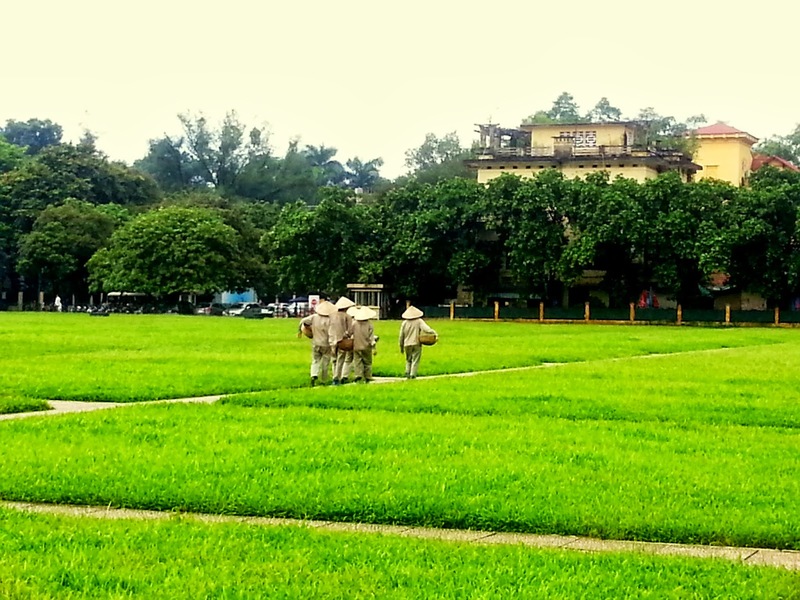 We walked back to Little Diamond Hanoi and got ready for dinner. I found a place on Foursquare and we walked down the stairs. When we reached the bottom, the man at the front desk, who we had on many occasions struck up conversations with, made it a point to tell us he would be getting off his shift and would not see us when we left. We said our goodbyes, and he asked us what our plans for the evening were. I told him. He said that was no good; we should go to a place he takes his girlfriend to, The Gourmet Corner. We went home ready for our next adventure: The island of Phu Quoc. If you want to read about the previous days, you can read Day One, Day Two, or Day Three.